Wiggins, who won the Tour de France and Olympic time trial last year, had led since winning the third stage and began stage eight with a 26-second advantage. 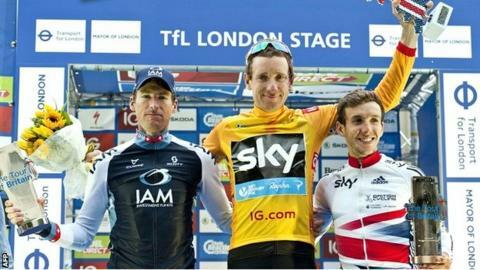 British road race champion Mark Cavendish won the concluding stage, his third stage win in this year's race. Following a remarkable 2012 in which he was also knighted and voted BBC Sports Personality of the Year, the Briton has been blighted by fitness problems this year. He had to pull out of the Giro d'Italia because of a chest infection and was unable to defend his Tour de France crown because of illness and injury. Wiggins' victory is a second successive home win in the event after Jonathan Tiernan-Locke, who did not compete this year, won it in 2012. "I said I wanted to win it. It is pressure for the whole week," said Wiggins, who finished safely in the bunch and now turns his attentions to Wednesday's Road World Championships time-trial in Italy. "Until you cross the line you just don't know. It's all right to think it's a bit of a ceremony round London, but it certainly isn't. "You cross the line, you're pumped up. It's relief that you've finished and fulfilled it for your team and your team-mates." "This race is thriving. The amount [of spectators] is something I didn't think we'd see," said the 28-year-old, who now has a record 10 stage victories in the event. And Simon Yates, the British Under-23 team rider who completed a successful day for the home nation by placing third overall, said: "The crowd was unreal. The noise all the way round was deafening." Ahead of the men's final stage, the Westminster Grand Prix was staged for women and was won by Hannah Barnes, who has dominated the domestic scene this season. There will be a separate women's Tour of Britain next year.